The San Francisco Chronicle goes boy crazy in Las Vegas. The Hotel San Remo, by Las Vegas standards a small (711 rooms) property a block east of the Las Vegas Strip, will become Hooters Casino Hotel next spring. The Beatty Museum: beyond the radar. A Hooters Beach Club and a Dan Marino Fine Foods & Spirits Restaurant are planned. Hooters, whose slogan is “delightfully tacky, yet unrefined”, presents a powerful contrast with high-style Strip resorts like the Bellagio and the new Wynn. Berlin-Ichthyosaur State Park: way beyond the radar. 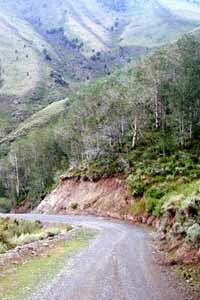 The Kingston Canyon Road leads west over the summit of the Toiyabes and down the other side to the Reese River Valley. 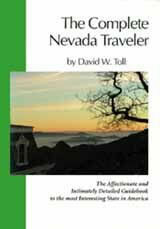 desert and history and interesting characters to really enjoy rural Nevada. To me, the ten that are checking out Beatty are the only ones you want. 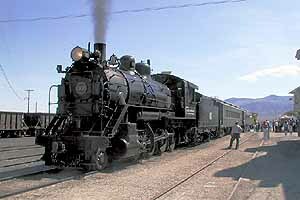 I was through Ash Springs not long ago, and heard good things about its future. The casino development that had been feared is not going to happen. A new owner has plans to develop the pond for public recreation as it was for so many years, and there are plans for improving the smaller BLM-owned spring nearby as well. 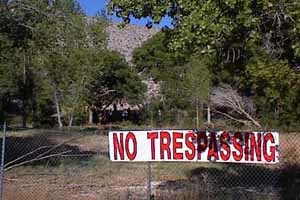 It looks bad right now with the chain link fence and all, but the future promises to be much, much better. More recently still, Robin and I made an excursion through the far northwest, Nevada’s emptiest corner. 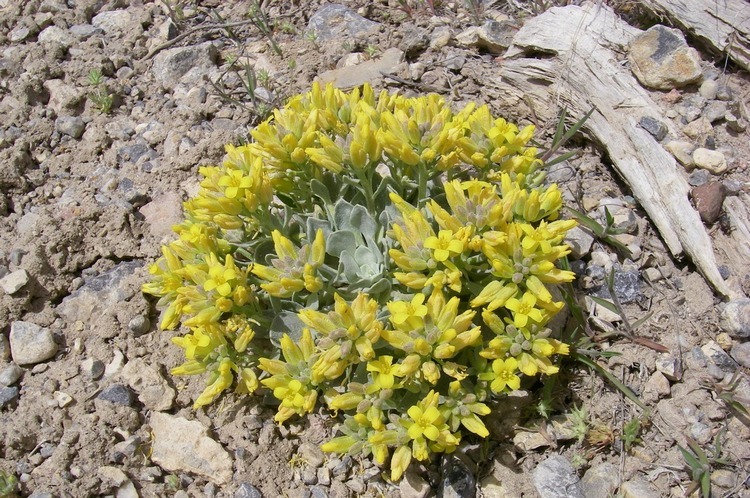 We went south from Winnemucca, drove a couple of hours on gravel roads, and then up into Salsipuedes Canyon, over the summit of the Pogonip Mountains past Sky High City and the road to Nowhere, then down the other side to an unmarked pair of ruts leading away into the sagebrush. After an intense hour of 4-wheel rock-crawling, we arrived at the Cow Camp. The Cow Camp line shack. camp, a place to gather the cows for a day or two to sort and brand them before moving them on. There’s a horse corral now largely overgrown by spring-fed willows, and there’s a little line shack with a wood/propane cookstove, a rickety table and benches, and a metal bed with a rusty set of springs. The view is superb, the autumn colors sublime. Below us some 50 antelope have been startled into springing away, the herd flowing like liquid across the dry lake bed. We could be in Africa. Anywhere. Only our camp gave any hint of humanity. 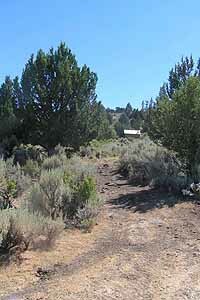 Even the steep road in was hidden in the sagebrush a few feet downhill. It’s a hard place to leave. 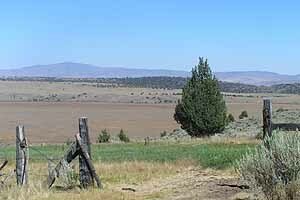 When we did leave, reluctantly, we proceeded across the California state line to Cedarville at the foot of the mighty Warner Mountains, and from there we drove 20 miles east (back into Nevada again) to bunk up at the Yella Dog Ranch at Vya. 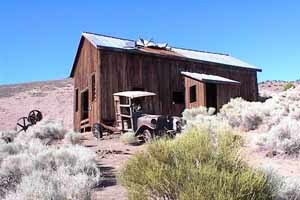 This is one of Nevada’s most remote lodging. To be precise, in its current state of development it’s not a B&B but a B&BYBWY: Bed & Bring Your Breakfast With You. Dr. Larry is the resident ranch hand at the Old Yella Dog Ranch. 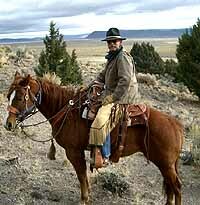 Larry Milham is a genial and resourceful concierge in chaps who can introduce you to the many wonders of the area. Larry gave us the coffee we’d forgotten to bring, and after a cheery cup on the porch we hiked up to the gray outcrops — compressed volcanic ash slowly eroding into fantastic shapes — and the great cave that was once a volcanic bubble. Its ceiling is smoke-stained, and there are arrowheads to be found glittering in the sagebrush nearby. 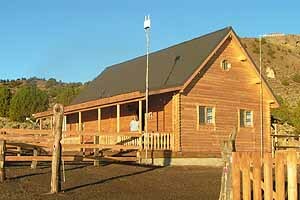 The plan for this old ranch is to create a small 1880s western town with guest cabins sprinkled across hillside near the General Store and the Cook House/Saloon. So far they have built a new Ranch House — three bedrooms with kitchen, bathroom, laundry and loft — and almost-finished General Store up the hill. When they’re done there will be a scatter of cabins near the store, a saloon and dance hall, a Sheriff’s Office, a church, even a cemetery to represent a settlement in the 1880s. There will be no telephones, no internet or modern conveniences except electricity, running water and flush toilets. 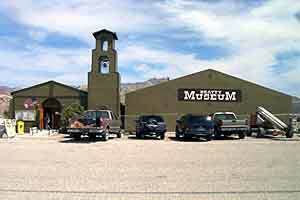 Visitors will park down by the gate and get around on foot, horseback or in the ranch wagons. Lake Tahoe’s South Shore has new owners and a new name: MontBleu Resort Casino & Spa. The hotel will remain open during the transformation, which will include remodeled restaurants, nightclub and casino . . . While we’re at the lake, the Lake Tahoe Visitors Authority (LTVA) has launched a new web site . . . Way further south, in Goodsprings, John Kaye & The Overlords played over Labor Day Weekend at the Pioneer Saloon. Says John: “Our 4th engagement was one to remember! 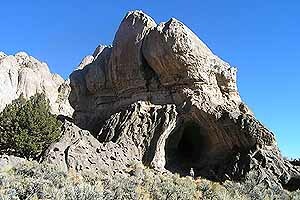 This is a most amazing place to visit, less than a half hour drive south of Las Vegas. This bar nearly a century old still maintains the charm of the Old Wild West.” Interesting, yes indeed, maybe even fascinating. But charming? Goodsprings traces its beginnings to 1868 when Joe Good settled at the spring here. Through the mostly hard times since then, Goodsprings has sometimes grown and mostly withered with the fortunes of the nearby mines. In the process the saloon evolved into an informal community meeting hall, triage station and improvisational psychodrama performance center . . . Here is a great site for anyone interested in the history and heritage of the Great Basin Indian peoples: The Great Basin Indian Archives . . . Among so many other things, Burning Man stimulates some terrific writing.